We continue to like AA REIT for its visible pipeline of redevelopment opportunities and untapped GFA. 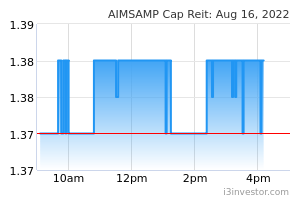 AIMS Financial Group’s recent buyout of AMP Capital’s stake a positive move, in our opinion. A leaner ownership structure promotes agility and speed in execution for further value-accretive and M&A opportunities that may arise. 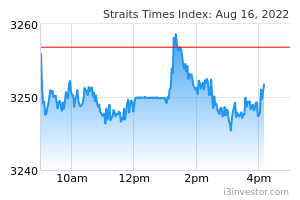 Maintain BUY; Target Price adjusted to S$1.50 on more conservative discount rates. Being predominantly focused on Singapore, we like AIMS AMP Capital Industrial REIT (AA REIT) for its diversified asset portfolio and attractive exposure to in-demand properties such as business parks and modern ramp-up facilities. Supported by master leases with built-in rental escalations, AA REIT offers investors a higher degree of income certainty ahead of the sector’s anticipated recovery in 2020 with attractive dividend yields of 7.7-7.9% p.a. over FY19F-21F. We see AA REIT as unique for its 600,000 sqft of untapped gross floor area (GFA) - one of the highest among peers. Given the prime location of selected properties, we believe that the Manager can potentially redevelop these sites into future-proof assets such as data centres and estimate that the unlocking of unutilised GFA could lift its pro forma FY18 revenue and NAV by 15.8% and 7.9% respectively. access to untapped GFA within the portfolio. Including untapped GFA, AA REIT’s implied yield (NPI/EV) of 6.4% would place it at the upper end of its peer range of 5.1-6.6%. Maintain BUY; DCF-based Target Price lowered to S$1.50 after raising WACC to 6.7% (from 6.6%), based on terminal growth rate of 1.4%. The redevelopment of AA REIT’s under-utilised sites could raise its fair value to S$1.58. Key risks include lower rental income arising from increased competition and prolonged negative rental reversionary trends. Rental reversions remain negative at 9.8% during the quarter, but compares well against double-digit rental reversionary levels in the previous year, reflecting an improving trend. Meanwhile, the uptick in occupancy levels should continue to feature positively in AA REIT’s top line performance in the upcoming quarters. NAV remained stable at S$1.37 per unit as valuations for its Singapore portfolio, which firmed up slightly, were offset by unfavourable foreign exchange (forex) effects on its Australia investments. Gearing (A/L) was unchanged at 33.6%, with all-in debt cost of 3.6. This includes AUD funding for the Optus Centre. This implies gearing headroom of > S$150m. As the industrial sector continues to bottom out, we believe that growth over the near-to-medium term will likely be driven by selective redevelopment opportunities, including the unlocking of over 500,000 sqft of untapped GFA. On 21st Nov 2018, AIMS Financial Group proposed the acquisition of fellow Sponsor, AMP Capital’s entire 50% interest in the Manager (AIMS AMP Capital Industrial REIT Management Limited) and 10.26% stake in AA REIT. On 30th Nov, AIMS announced the establishment of a S$750m multi-currency debt issuance programme. In view of the rising rate environment, we have raised our borrowing assumptions by 50bps to 4.2% to be conservative, which reflects a 60bps buffer vs its average borrowing cost of 3.6% in Sep 2018.